Last week, in a hot and crowded room deep within the Houses of Parliament, myself and fellow researchers from The Sussex Energy Group (SEG) and The Centre on Innovation and Energy Demand attended the launch event of the All-Party Parliamentary Group (APPG) on Limits to Growth. The APPG, chaired by Green MP Caroline Lucas and co-chaired by Scottish National Party and Labour MPs, aims to “provide a new platform for cross-party dialogue on economic prosperity in a time of environmental and social transition” [pdf]. Based on the (in)famous landmark publication by the Club of Rome in 1972, Limits to Growth takes a critical analytical look at an array of social, economic and environmental parameters and attempts to model possible future societal outcomes. 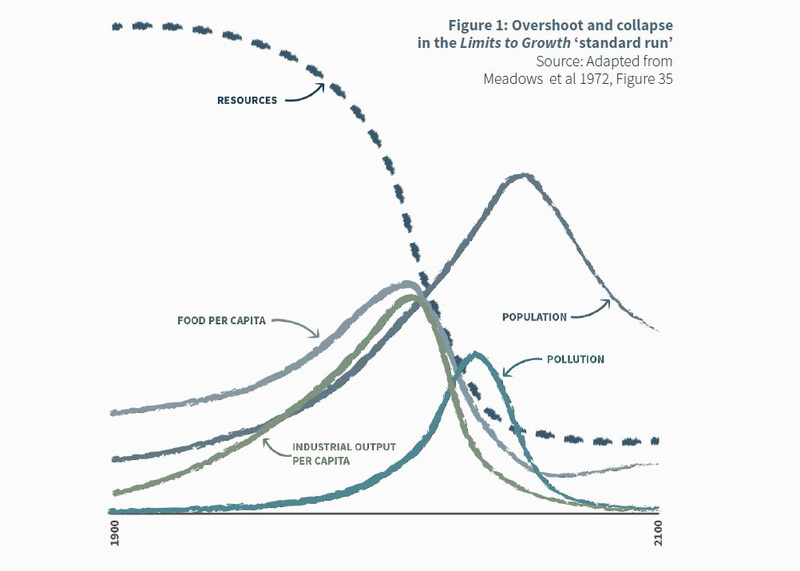 The results paint a fairly bleak picture; two thirds of the scenarios predicted the future collapse of population, caused in part by food shortages and/or excessive pollution, by the mid- to late-21st century. This, the authors argued, suggested that we must reconsider what it means to live on a finite planet with an ever-growing economy. Models of Doom – societal collapse predicted in LtG’s standard run. Jackson & Webster: “Limits Revisited” (pdf), 2016, fig. 1. SEG, via its home institution Science Policy Research Unit (SPRU), has a certain degree of affiliation with this topic. For one, Caroline Lucas, the UK’s first Green Party MP, is the MP for Brighton & Hove, with the University of Sussex falling within her constituency boundary. Moreover, though, SPRU was one of the early critics of the Limits to Growth report. Shortly after its publication, Chris Freeman and other SPRU titans produced a trenchant critique, in part arguing that its authors had paid far too little attention to the potential for technology and innovation to bolster productivity and stave off the deleterious effects of resource depletion. “Malthus with a computer”, others suggested, would prove to be just as duly discredited as was the original 19th-century cleric. Controversy aside, the publication certainly helped to spark a much-needed debate on humanity’s use of resources, and remains the highest-selling environmental title to date. Nearly half a century later, the APPG, with the help of Tim Jackson (author of Prosperity without Growth) and Anders Wijkman (co-author of the original report), have returned to the subject to see what has changed. Evidently, society hasn’t collapsed. Although, more a cause for concern, many of the parameters in the “standard run” of the original model have tracked reality well in the intervening years. The concept of “Planetary Boundaries“, which has gained prominence in recent years, also suggests that we are, in some respects, beginning to irreversibly overshoot certain aspects of the Earth’s carrying capacity, namely in the domains of climate change, biodiversity loss and the nitrogen cycle. This certainly rings true with some of the Limits’ suggestions. Limits to energy use – energy or carbon decoupling? As scholars of energy demand and efficiency, what have we witnessed in the intervening years and what can we say about the future? Many interpreted the original Limits theory as suggesting that we would “run out” of non-renewable resources before the end of the 20th century or soon thereafter; evidently not the case. However, the quality of unconventional resources being extracted is certainly diminishing. Although the Peak Oil debate is on something of a hiatus, the Energy Return on Energy Investment (EROEI) of shale oil and other unconventional fuels is much lower than that of conventional production. A declining productivity of resources – both in terms of EROEI and economic return – was in fact one of the predictions of the original Limits report. Whilst we may currently be seeing an era of abundance due in part to ever-more efficient road vehicles as well as a geopolitically motivated excess of supply, this hasn’t translated into the conventional boon for global economic growth many expected it to be. Of course, the debate around whether or not we can continue to experience green growth on a finite planet relies upon our ability to decouple GDP from carbon emissions (as well as other environmental damages, of course, but our focus here is primarily on carbon). Whether or not this requires a decoupling of energy use from economic growth depends upon the ability to decarbonise our primary energy supply and reach “net zero emissions”. The feasibility of doing so remains to be seen. The process of capturing waste carbon dioxide (CO2), called Carbon Capture and Storage, and nuclear energy have faltered somewhat, biomass for energy faces huge land competition, and whilst renewables are looking increasingly promising, their deployment remains in its nascent stages. Embracing energy-GDP decoupling, then, may be necessary too. This would entail increasing the efficiency with which we convert primary energy into its useful forms, as the inputs to energy services we demand as users. Energy efficiency has been touted as a “first fuel”, yet still doesn’t receive quite the same level of attention as the construction of big, shiny new power stations. Primary energy decoupling in the UK. Left: Total primary energy supply in TJ, red (IEA) and real GDP in £bn 2000, blue (ONS), 1960-2013. Right: Decline in the ratio TPES/GDP. Empirical data suggests that many countries in the developed world are decoupling primary energy use from economic growth. In the UK, for example, primary energy consumption has declined whilst GDP growth has remained positive in recent years; the ratio of the two (the “economic intensity of primary energy”) has thus fallen. Does this disprove the theoretical basis for the Limits? Perhaps not. This “absolute decoupling” is far less than the required levels to fully dematerialise the economy, and the rather crude primary energy intensity measure belies the significant levels of embodied energy within our imported goods. But recent research also suggests that looking at primary energy is getting the wrong end of the stick. Rather, energy demand should be examined at the useful stage (and in reality, useful exergy is the more appropriate measure). It would appear, according to some authors, that the ratio of useful exergy to GDP is more constant than that of primary energy. If this were the case, there would be implications for the extent to which energy-GDP decoupling can occur through energy efficiency alone, suggesting that decarbonisation should be a high priority, as well as a potential shift in focus from efficiency to sufficiency. How politically feasible would a transition to a steady-state, or low/no growth economy be? How might we prioritise measures of wellbeing other than GDP? Are any of these even necessary? It was admittedly a pleasant surprise to see these issues having made their way even to Westminster, even if it was just a stuffy committee room. Of course, there still remain significant political challenges for a sensible discussion on environmental limits vs green growth, such as the dominant neoclassical economic paradigm which enjoys the favour of policymakers. But with the threats of secular stagnation, rising inequality and incessant climate change increasingly obvious, perhaps even the formation of the APPG in itself should be a celebrated as an opportunity to open up the discussion of our future prosperity – economic or otherwise – to those who would otherwise ignore it.